MyLifeBrand is a service that lets user’s aggregate social networking memberships and navigate between them from the one place. 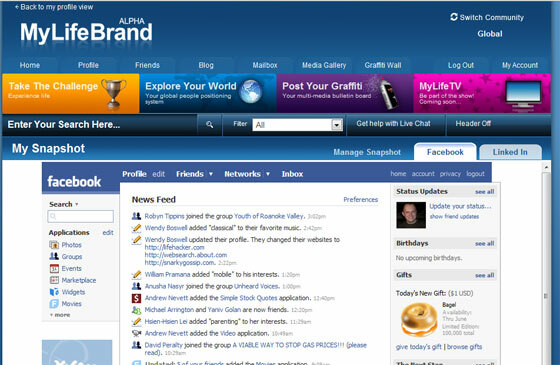 MyLifeBrand supports Friendster, LinkedIn, Bebo, Facebook, H15, Orkut, MySpace, and TagWorld among others and is working on support for a number of niche social networks including Angling Masters, Navy Seals and Drunk Duck. Users are also able to add their contacts from external networks to their MyLifeBrand friends list creating a master friends list. The difficulty in managing multiple social networks is real and any heavy Web 2.0 site user will understand the problem. We covered Spokeo in November 06 and a number of similar services since. MyLifeBrand gives social networking aggregation a decent shot, however presenting external sites in a frame doesn’t work for me (see screenshot). The introduction of the Facebook’s F8 platform shows the real direction in this space. Facebook allows external sites and services to be integrated directly into Facebook and not through frames as with MyLifeBrand, delivering a far superior user experience. This is not to say that MyLifeBrand won’t be able to find a user base, it’s just that they are probably 12 months too late in releasing, and 6-12 months behind in delivery and integration to become a major player. The long tail is long and there is always room for new comers, so I do wish them luck; competing against Facebook will be a challenge.